A topping out ceremony recently took place where the new medical centre is being built in Wellesbourne to mark the building reaching its highest point. Photo submitted. A topping out ceremony has taken place at a new medical centre being built in Wellesbourne which will serve more than 20,000 patients. The Alfreton-based firm Wildgoose Construction is building the Hastings House Medical Centre in Dog Close, as part of a £2.9 million contract. The topping out ceremony was held to mark construction on the building reaching its highest point and it gave doctors from the surgery, dignitaries from the Clinical Commissioning Group, Parish Council and Walton Estate the first chance to look around. The new facility will serve patients from Wellesbourne and surrounding villages including Ashorne, Gaydon, Lighthorne, Kineton, Pillertons, Ettington, Hampton Lucy, Alveston and Barford. 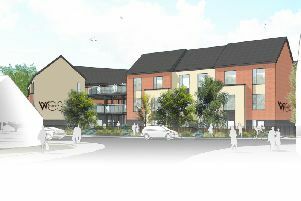 Initially with 10 GPs and six nurses it will have 16 clinical consulting rooms, a minor operation and treatment suite together with additional services such as pharmacy, physiotherapist, podiatrist, health visitors and other complimentary therapies will be delivered in addition to the standard core GP services. The new building has capacity to expand as the local population grows. Dr Martin Read-Jones, from Hastings House Medical Centre, said: “We are delighted with the progress to date and it’s good to see the building finally taking shape. We’re also pleased to be able to invite those who have made vital contributions to making this a reality to this topping out ceremony, in order that they can share in the achievement so far. Jonathan Wildgoose, Executive Chairman at Wildgoose Construction, said: “This medical centre will provide start-of-the-art facilities for the people of Wellesbourne and the surrounding areas. The new building is on track to be completed in December.